Synonyms: Cephalandra sessilifolia.Sonder 1862, C. schinzii Congiaux 1895, Citrullus naudinianus Hook.f.,Colocynthis naudinianus Kuntze. It's dioecious. These are male flowers. The fruits before they turn red. 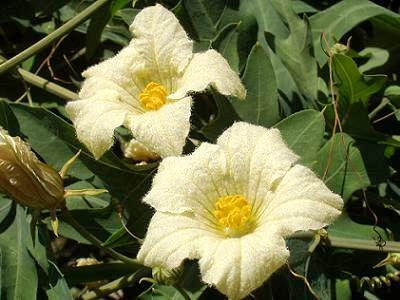 This nice Cucurbitaceae was first given this name by Célestin Alfred Congiaux in 1881. It is from southern Africa, where it prefers a well-drained soil, moderate water and moderate sun. 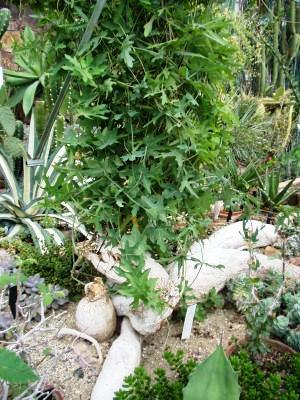 The caudex can grow to 20 cm in diameter, the vines five meters. It will produce small white flowers, and apart from seeds, it can be reproduced by cuttings. Leaf on a wild plant in Namibia. And a male flower in South Africa.